We’ve been overwhlemed with parties. Even with the economy in a recession business hasn’t slowed down…yet (knocks on wood). I just read an interesting fact posted on the Hawaii Baby Expo website. In 2008, there were over 19,000 births in the state of Hawaii. That’s a lot of babies. Heck, that’s a lot of dirty diapers…eeewww. Well, 95% of my parties are 1st birthday celebrations. It’s amazing how 1st birthdays are celebrated here in the islands. It’s a phenomenon. I tell many to call the travel channel to do a documentary. Someone invite Andrew Zimmern of Bizarre Foods or Anthony Bourdain of No Reservations. Well, to all the locals…you lucky you live Hawaii. MAGIC SHOW UPDATES: We have debuted a few new materials for the show over the past year such as the incredible growing/shrinking head as performed by Bruce Kalver, OLBS 2.0 by Jay Mattioli, and Big Babies by Axtell Expressions. 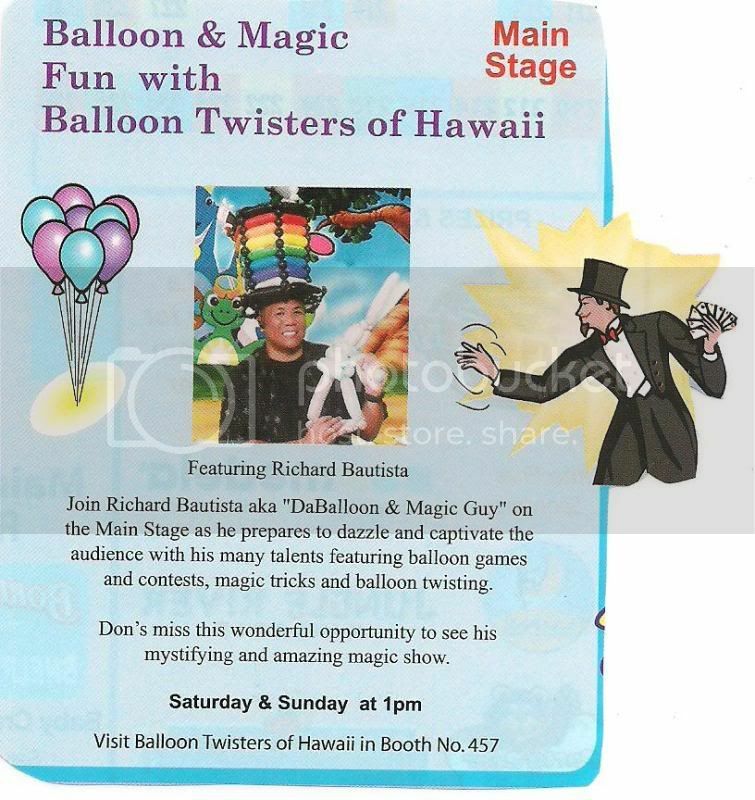 I know I’ve shared that we wanted to add some excerpts of the show, well we’ve just added a few video excerpts that’ll be added to the official Balloon Twisters Hawaii website…see the actual videos below. Professionally, I was voted as the new acting Vice President of the International Brotherhood of Magicians (IBM) local chapter. Other notable members in IBM are Mike Ching, Professor Fun, Glenn Bailey, and more. IBM is the largest organization of magicians featuring over 12,000 members worldwide and over 300 local groups called rings in more than 73 countries. I am blessed and honored to be able to network and be a part of a great organization. Personally, I’ve been accepted to the University of Hawaii’s Master’s Program and will be starting in the fall. That’ll mean I may have to cut back on the business for a bit. We’ll see. I’ve always wanted to earn a master’s degree, but more importantly I wanted to wear the green and white of the University of Hawaii. I can be an alumni. Wow, I can truly be a UH Warrior fan. I got to sport the UH logo on my car now…lol. More updates…please be sure to check out the Balloon Twisters Hawaii page on Facebook and become a fan. So, what are you waiting for? Tell your friends to invite ”The friendliest balloonists, magicians, and face painters in the 808 state” to their event. We are discontinuing the calendar of events on the blog. Click on the link www.balloontwistershawaii.com. to see the most up-to-date calendar of events. I have had some professionals advising me to remove or relocate the calendar, but based upon my bookings, many have shared that it is one of the many reasons that they book our services. We finally have some video excerpts of the show. I’ve got a few more to come. I couldn’t download everything at once. One features the “Ring in Gumball Machine and Ring-a-Majig” and the other features “Big Babies.” I hope I can bring some smiles and laughter to you and your friends…ENJOY! 1) The 5th Annual Oh Baby! Family Expo. This event featured lots of exhibitors showcasing services and products for families. As far as attendance, there were 10,000+ over the 2-day event held on 10/18-19. c) On many of the Honolulu Advertiser’s People community weekly newspaper. The West Oahu People weekly newspaper featured an article about me and my start in the entertainment business. Many people have shared that they’ve seen me in the newspaper. I’m surprised because there are many that read the newspaper. I was also offered an opportunity to be on the KHON TV morning news, but I couldn’t make arrangements to make it happen. I thought about my students and went to work on time…hahaha. Overall, being a vendor at the Oh Baby! Family Expo was a great experience. 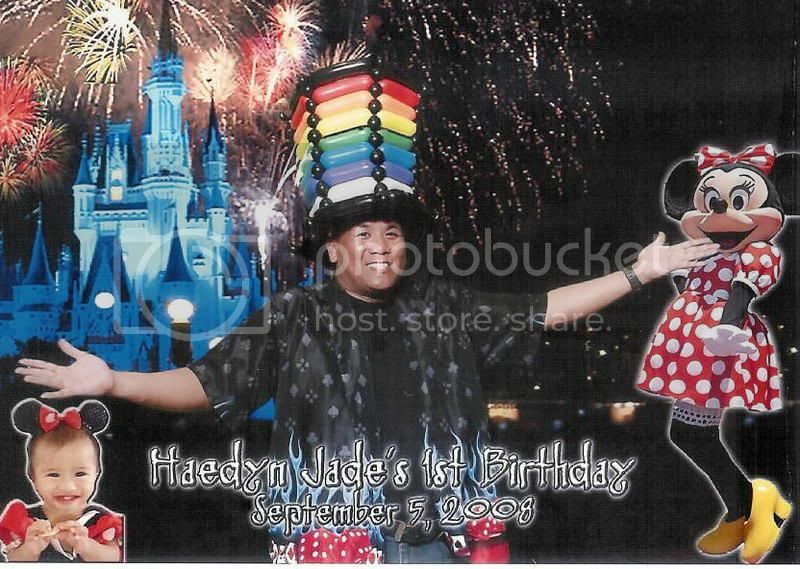 We were able to book many parties, network with other business, as well as share “The friendliest balloonists, magicians, and face painters in the 808 state. We were also able to drink unlimited menehune water and slush floats…hahaha…yummy. I actually signed up for a Menehune water dispenser and got 15-gallons of water for free…what a deal! 2) We were also a part of the Hawaiian Waters special event held on 11/07. The event featured the new park owners…Village Roadshow Limited (VRL) whose assets include Warner Bros. Movie World, Sea World, and Wet n’ Wild Water World. The event was held during the evening hours and featured many exhibitors and entertainers, but the highlights of the night were the water rides, the dive-in movie “Kung Fu Panda,” and the surprise FIREWORKS spectacular. Thousands enjoyed the festivities. Throughout the night, we also amazed people with our balloon sculptures and our friendly attitude. We also updated the website to list specific testimonials under each of the services we provide (face paint, balloons, and magic). We also reorganized the price page to make it more understandable. We even added another package, which offers street magic and balloons (Package D). We’re working very hard to add some excerpts of the show and will hopefully get it up by the end of the year. PERSONALLY, I’ll be gone during the first week of December for a Disney trip with my son Kenton. It’ll be our 2nd Disney trip this year. I’ll be sure to post some pictures. Upon our return from the mainland, we’ll perform at the Fantastic Sam’s Christmas party. We’ve been performing for the Fantastic Sam’s Christmas party for the past 2 years. We’ve also been able to perform at many of the employee private events too. We are discontinuing the calendar of events on the blog. Click on the link www.balloontwistershawaii.com. to see the most up-to-date calendar of events. Since we’re going to Disneyland, here’s a video of one of the most enjoyed fireworks shows, entitled “Remember, Dreams Come True.” It’s a mix of fireworks, lights, music, and more. I hear that there’s going to be a Christmas parade. “It’s a Small World” will also be decorated in a Christmas theme. After the holiday season, “It’s a Small World” will be closed for construction. The new version of “It’s a Small World” will feature new boats, Disney characters placed in their respective countries, and more. Disney’s California Adventure is also building the new “Disney Cars” land and the “Little Mermaid ride” to be opened during the parks anniversary celebration in a few years. It’s been very busy as of late. I am posting this month’s blog kinda late. I’ve been booking many packages lately and that’s a good thing. I’ve performed the most magic shows this year than in my 13 year history of being in the business. I’ve also been able to add more balloon twisting designs to the menu bringing the selection to over 50+ balloons. I’ve also been able to find a reliable face painter and am in the process of working with other companies to build a partnership to provide deals for the consumers. SO…I thought of posting some referrals to other business that I’ve been able to work with at various events and parties. Although I am posting some business that I normally would refer, I do not take responsibility for their business promotions, actions, or activities. If you or your friends will be checking out their services, please let them know that I’ve referred you. Pacific Photo Company: http://www.pacificphotocompany.com/ This company, as its name states, is a photo company. They set-up a backdrop and party goers pose for pictures individually or in groups. The photos are uploaded to a computer and each person is able to select from various backgrounds. If party guests want to purchase additional photos, they can purchase them at an additional charge. Each photo comes with a cardboard frame. I’ve worked with them on numerous occasions and they do get large crowds. If you haven’t taken a group or family photo, this is a great opportunity. Check out the photos that I took. Greg Gabaylo: http://www.greggabaylo.com/ He is a master hypnotist and the world’s fastest juggler. I’ve watched both his comedy hynosis and juggling/magic show and he’s hilarious. I’ve worked with him on many occasions and I enjoy his company and his professionalism. 808 Sounds: http://www.808sounds.com/ If you’re looking for a professional DJ, check these guys out. Again, I’ve worked with them many times and they are very flexible. Chewy’s Snacks: 674-8386 They provide shave ice party packages for various events and occasions. I’ve tasted shave ice and these guys have some of the finest shaved ice. Finer shave ice means that it holds the syrup. Trust me…this will be some of the best shave ice you’ve tasted. Royal Hawaiian Caricatures: 923-6714 Recently, I’ve been working with them a lot. I always wanted a caricature and know how much they can cost. Go to Waikiki and find out. I’ve seen these guys and the photos are numero uno and they’ve been around since 1969. 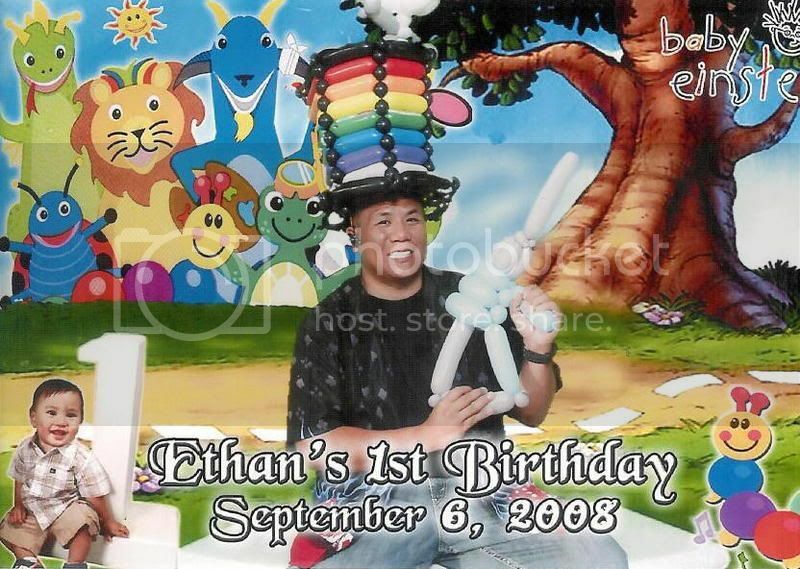 Don’t forget, if you want QUALITY Balloon Twisting, Face Painting, and Magic (Close-up or stage)…contact the friendliest balloonists, face painters, and magicians in the 808 state. I got 2 season tickets to the UH Football games and the pay-per-view package, so I’m trying my best to be able to go to the home games and watch the away games…hahaha. *The most up to date calendar of events…visit www.balloontwistershawaii.com. See calendar of events. Here’s some videos that I’ve seen on youtube. Check them out…they’re absolutely AMAZING! The first video features Soma’s act performed at the Magic Festival of Meribel 2008. It’s very entertaining and I know you’re going to flip out when you see some of his stuff. It’s 7 minutes of pure fun entertainment. The second video features Jason Jacobs card magic. I like it because it’s one continuous shot. Listen to the words of the song because the magic is performed with the lyrics in mind. NEXT MONTH’S ISSUE: A new video performance, more photos, and updates.